2016 marked the tenth iteration of Gary Richards’ flagship festival, HARD Summer. Though issues stemming from casualties at 2015’s installation caused the event to be held outside of LA County — at Fontana’s Auto Club Speedway — HARD Summer still drew the paramount lineup that festival-goers have come to expect from the series, as well as a staggering 146,000 attendees over the course of the weekend. 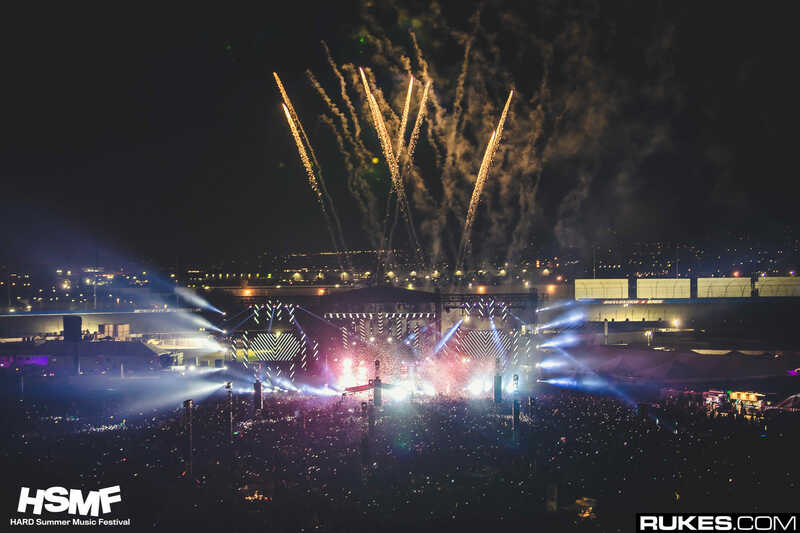 Between the festival’s remarkable musical talents, impressive, but minimalist stage designs, and inaugural inclusion of a camping section for patrons, HARD Summer 2016 was a success in many ways. However, the festival also encountered its share of setbacks, from venue inaccessibility, to overcrowding. Unfortunately, a higher number of fatalities than 2015’s iteration of the festival further marred its legacy this year, which may place Richards’ company in an uncertain position of how future events will be held. Below, we’ve included some particularly notable highlights and detriments from HARD Summer 2016. While Pretty Lights always provides an awe-inspiring set, his HARD performance was not without its share of issues. It is very difficult to contain the magnitude and technical complexity of a Pretty Lights set into festival stage and time frame. A number of sound issues pervaded the performance, perhaps most notably the faulty setup of his microphone, which precluded Smith from speaking to the crowd — an instrumental aspect of his sets’ energy during both buildups and song transitions. Furthermore, the absence of his unique stage setup and Greg Ellis’ signature lasers detracted somewhat from the show’s overall essence, while the compact set time made it difficult for Pretty Lights to smoothly include the band’s jam sessions which have become set staples since his Analog Future tour. However, Smith and his band overcame these issues with their riveting live renditions of key songs throughout his musical oeuvre. The more electronically-oriented cuts from his set’s latter third (including crowd favorites like “Let’s Get Busy,” “Around The Block,” and “Finally Moving”) enlivened the crowd for the first day’s final act, and Pretty Lights’ show undoubtedly reached its climactic moment during his encore. Though the overbearing lights of the speedway abruptly came on when the festival concluded at 11:00, brightly illuminating the crowd, Derek refused to leave the stage without playing his perennial encore, “I Know the Truth.” Smith took advantage of a rare moment during which his microphone actually worked, to preface his encore by saying “HARD, I’m gonna play one more song if that’s cool with you.” Though the stage’s sound was cut directly after his encore’s first drop, reveling in the fully lit audience during the illicitly-proffered concert conclusion was a moment that few in attendance will soon forget. Photo via HARD Presents… Facebook. For fans of the Berliner techno God, Boys Noize‘s Sunday performance was perhaps the most steeply-anticipated sets of the weekend. Unfortunately, flight delays postponed Alex Ridha’s set by thirty minutes, so his set was inevitably truncated to 40 minutes – leaving the DJ with a tall order to fulfill his full Mayday set. However, being the veteran performer that he is, Boys Noize was able to surmount the challenge of shortening his set and purvey one of the most energetic sets that the HARDer stage saw all weekend. Commencing the shortened show with his now legendary Mayday opener “Overthrow,” before moving into his 2015 hit “Cerebral,” Ridha managed to purvey a staggeringly impressive festival set through his deft, quick transitions, astute song selections, and Sus Boy-provided visuals. After sound issues and time delays plagued sets from veteran performers Pretty Lights and Boys Noize, cynics may have been tempted to discount the HARDer stage’s efficacy at hosting some of the lineup’s more momentous performances. Porter Robinson‘s closing set, however, did more than assuage these doubts, filling such cynics’ glasses from half-empty to overflowing. While it’s difficult to translate the evocations of conceptual, truly experiential performances in full to the rigidly-scheduled time frames and universal stage setups of any festival set. However, Porter Robinson and HARD collaborated to deliver the prodigious producer’s Worlds performance as impressively as it would be in an independent Porter show – if not more so. The intricate visuals of the Invisible Light Network that provide a foundation to Robinson’s Worlds set were perhaps more blissfully overwhelming than ever before when emblazoned upon the towering LEDs of the HARDer stage, and the outdoor setting provided Robinson’s team the freedom to safely be more grandiose with the performance’s staple pyrotechnic effects than usual. Standing before the HARDer stage’s largest crowd of the weekend, Robinson worked through his performance with aplomb from behind his glass alter, proffering both the live edits that have become beloved staples of his recent shows and providing a series of new edits, previously unknown to those in attendance. As is always the case, HARD Summer’s lineup consisted of a strong list of contenders to top; that Porter Robinson came out as the weekend’s premier performer is a testament to the young producer’s remarkable talent, and a milestone in his career. Any event that hosts over 70,000 guests per day is bound to risk the plague of overcrowding. However, the Auto Club Speedway was particularly susceptible to this issue because of its layout. Once patrons had passed through security, their journey into the event had only just begun. As with any speedway, the venue consisted of stadium seats, a large eliptical track, and a fence separating the two areas. For a singular event, there would be no issue with this setup: general admission ticket-holders would be able to occupy the seated area, while other attendees would be granted access to a standing area on the track. For a festival of HARD Summer’s stature, this convenience was not the case. While attendees were given access to the seated area, this only allowed them a distant view of the HARDer stage. To actually gain access to the racetrack – a necessity to access all of the event’s other stages – fans were forced into a dense crowd, herded into a series of bottlenecks by a hapless crew of security guards. This is an issue that HARD may have intended to combat with their introduction of a camping area, which presumably provided its residents a separate entrance into the festival grounds. However, even with this caveat, entering the festival was a supremely stressful situation for any attendees arriving during peak hours. Perhaps even more stressful than entering HARD Summer, was exiting the speedway. At 11:00 – the festival’s enforced curfew – the entire crowd was required to walk in a loop around the speedway in the same direction, as all of the alternative fence exits were closed off by security. To HARD’s credit, this facet of organization was a necessary safety precaution – a mass exodus of over 70,000 agitated fans leaving in opposite directions is a recipe for trampling. Speedways were, at one point in rave history, a preeminent type of venue to hold events. However, with the amount that the electronic music event industry has grown in the last several years, such festivals have long outgrown these enclosures. This iteration of HARD Summer marked the first time that the event occupied Fontana’s Auto Club Speedway. It’s unclear at this point whether the festival will continue to be held at this venue. However the backlash that HARD received after the deaths at last year’s HARD Summer – and the further criticism they are already receiving from the higher death toll at this year’s festival – it is likely that the event will continue to be held outside of LA County. While HARD was gracious enough to include a $20 Uber gift card to attendees in their ticket packages, the sheer number of festival-goers attempting to leave the venue to return to Los Angeles (or the closest hotel they could book) entailed that a number of attendees were stranded in Fontana hours after the event had concluded. It is almost standard practice for difficult-to-access festivals to provide shuttles for attendees between the venue and a centralized metropolitan location. Coachella and Mysteryland USA (held three hours north of New York City in Bethel Woods) are just two examples of festivals that provide such a service. Undoubtedly, the institution of a shuttle system for events the size of HARD Summer and HARD Day of the Dead would be very challenging, However, should HARD continue to hold events outside of LA county, their implementation of such a network would allow patrons a safer, more convenient experience and provide an additional revenue stream for the company. In summation, HARD Summer 2016 hosted a number of exceptional sets from its characteristically sterling selection of performers. Unfortunately, issues arising from the inaccessibility of their venue and its poorly-executed layout cast a significant shadow over the event’s performative successes. Following the tragic number of fatalities at both this and last year’s events, it’s uncertain what the future holds for Gary Richards’ seminal festival. If Richards and his team will surely continue their keen focus on attracting the high caliber acts that define HARD lineups. If HARD pairs this priority with a further emphasis on establishing an appropriately-organized venue and improving amenities for patrons, then the road ahead will be bright for the event production company – but not without its speed-bumps.